http://www.onenationuk.org is a UK-based charity working locally and internationally to support relief projects. They have been providing international relief with financial and humanitarian assistance in Syria, where in April 2016, they were distributing Sal's Shoes. Thanks to http://www.npac.org.uk, in June 2017 Sal's Shoes were finding their new feet with http://www.rahmarelief.org in the Kurbit Algoos surburb of Idlib, a city in northwestern Syria, 37 miles southwest of Aleppo. Sal's Shoes winter footwear finding new feet during a severe winter in Syria in December 2016 . . . lots of sandals were swapped for lots of boots with http://www.muslimsinneed.org. Thanks to http://www.npac.org.uk, in June 2017 Sal's Shoes found new feet with http://www.rahmarelief.org in the Kurbit Algoos surburb of Idlib, a city in northwestern Syria, 37 miles southwest of Aleppo. In September 2017, Sal's Shoes went back to school in Aleppo, Syria, with http://www.samarasaidappeal.org. Shoes were distributed to displaced children - either those going to school for the very first time or those returning for the first time in many years now that it's deemed safe to do so. Thanks to http://www.samarasaidappeal.org, in October 2017 Sal's Shoes and clothing have been distributed to 225 displaced families living in the north eastern part of the governorate of Damascus, Syria. Sal's Shoes found new feet in Syria in November 2017 with http://www.samarasaidappeal.org 42 families were displaced when a terrorist group took the area of Sheikh Maqsood in Aleppo. They have been living in a deserted school for six years since their area was taken. This terrorist group arrived in their neighbourhood and started beheading people who wouldn’t join them. Around 35,000 people fled and now they have nothing to go back to. Their rooms have no glass in the windows and none of them have doors, just a blanket covering the opening of their rooms. There are between 5-13 living in each small room. The toilets are just holes in the ground. Some of the children had no proper shoes, just flip flops. The New Forest and Hampshire Show attempted to break a world record at the 2016 Show which took place in Brockenhurst, Hampshire for ‘The Most Wellington Boots Thrown Simultaneously’. For the World Record attempt, https://www.joules.com kindly donated 500 pairs of wellington boots for participants to use. Despite being unsuccessful at breaking the world record, we were delighted to be donated the boots in May 2017. In November 2017 they started finding their new feet with http://www.samarasaidappeal.org in Syria at an informal camp where people having fled Aleppo have now set up makeshift homes. Many of them were barefoot or in broken flip flops and winter is rapidly approaching. 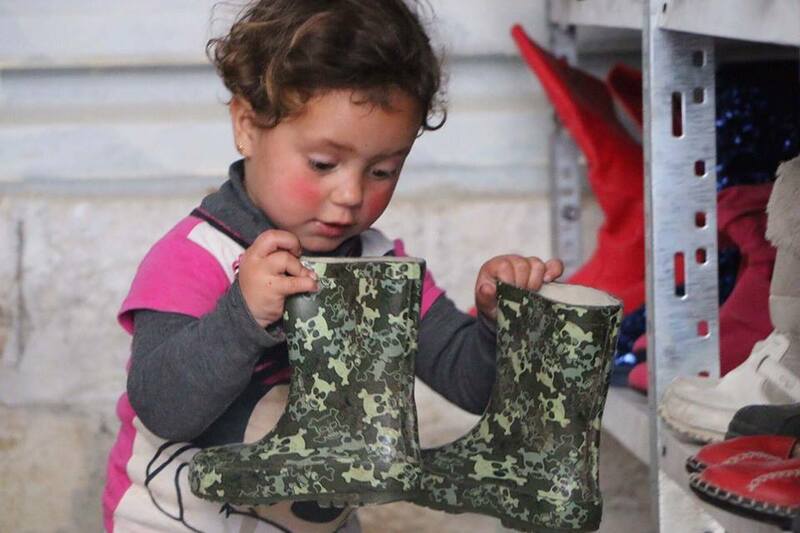 Sal's winter Shoes, including a large donation of snow boots from https://www.muddypuddles.com, have been finding their new feet amongst the children of Deir Ez-zor, Syria, in December 2017 with http://www.samarasaidappeal.org. Winter temperatures drop below zero in Syria, and there were barefoot children at our distributions. In June 2018, Sal’s Shoes have been finding their new feet in East Ghouta near Damascus, Syria 🇸🇾 with http://www.samarasaidappeal.org. Sal’s Shoes footwear for outside wear and Sal’s Shoes slippers for inside the communal tents and disused buildings they are now sheltering in. Sal’s Shoes are walking again amongst displaced families who fled from their homes in East Ghouta. Family sizes ranged between five and fifteen people with an average of ten, including extended family. Distributions were carried out in areas including Adra, Al Nashabia, Herjalla, Tal Al Nasir, Al Dwir, and Al Kiswa. The majority had arrived in these camps in the early part of 2018, whilst some camps contained families who fled when their homes were first taken by jihadists. These families arrived with what they could carry on foot, which in many cases were their small children. Many arrived with nothing except the clothes they were wearing. Most families are crammed into communal buildings and structures, small rooms, tents, and tarpaulin structures. Some families are accommodated in public buildings and schools with large numbers of people living side by side in very small spaces. Most of these camps and settlements are overfilled far beyond their capacity with the displaced people having made their own makeshift shelters from plastic sheets and tarpaulins held together with ropes, stones, pieces of wood and mud. Many of these are set up against the sides of buildings and in wasteland to accommodate the enormous influx of people who fled through the humanitarian corridors from East Ghouta during the intense bombing and fighting as the siege was being broken earlier this year. Significant numbers of the children in these camps had no footwear and roamed the camp barefoot. Some children were seen walking through the camps with just one oversized shoe or sandal, while other children were seen around the camps wearing odd shoes (one shoe and one sandal) of significantly different sizes. So many displaced people have flocked to Latakia because of its relative safety compared with other parts of the country. As a result, the schools are overcrowded and the children have to attend in two shifts. Some children do the morning shift of learning while others do the afternoon session. It has always been of the utmost importance that we maintain the premise on which we were built - to know exactly where every pair of shoes we’re sent finds their new feet. November 2018, in rural Syria 🇸🇾 an 18 month old little girl was found shuffling barefoot in the cold mud at the entrance to one of the poly tunnels her family are now forced to live in. Thanks to https://www.samarasaidappeal.org she now has a pair of your Sal’s Shoes wellies. Thanks to you her siblings now have Sal’s Shoes too. In December 2018, thanks to https://www.samarasaidappeal.org, this week Sal’s new Shoes have been finding their feet in Damascus, Syria 🇸🇾 in a centre for people who fled besieged East Ghouta earlier this year. It’s cold but many of the children are still wearing sandals in December. Some of the children wear sandals in sizes far too big for their little feet.